Starting from golden Amritsar we travel through scenic mountain landscapes of Northern India to reach the Buddhist enclave of Ladakh. On route we travel through high mountain passes, discover ancient Tibetan-Buddhist monasteries and on some departures take in special festivals. Our tour begins today in Amritsar, the Sikh's holiest city. After time to freshen up we visit the stunning Golden Temple. Shoes must be removed, feet washed and heads covered before we can enter (please bring a headscarf with you or buy one outside). The Golden Temple itself is a surprisingly small building surrounded almost entirely by tanks of holy water in which the Sikh pilgrims bathe. The atmosphere is one of incredible calm with devotees taking their turn to pass through the main shrine where there is a continuous and melodic recital (known as the Akhand Path) from the Guru Granth Sahib, the holy book. We also visit the nearby Jalianwala Gardens, site of the notorious massacre under General Dyer in 1919 which led to 379 Sikhs being shot from point blank range by British troops. 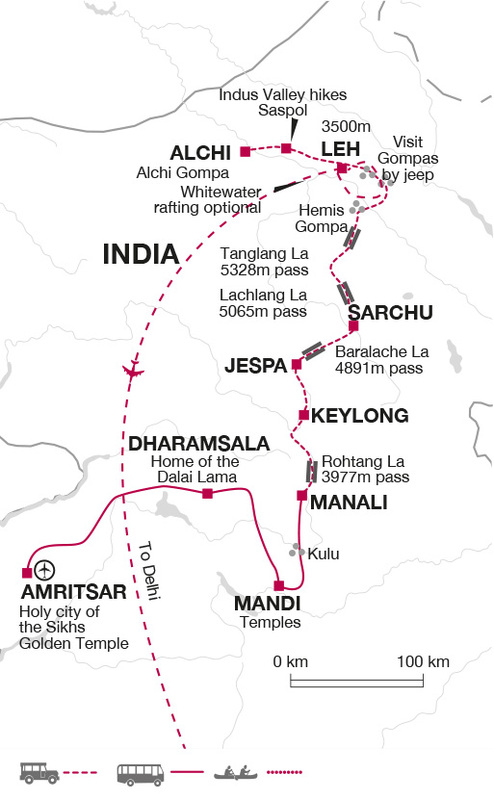 Today we drive out of Amritsar and cross the plains of the Punjab before making our way up to the old British hill station of Dharamsala. Until 1959 this was a quiet unassuming town, but that all changed when the Dalai Lama settled here after fleeing Tibet at the time of the Chinese invasion in October of that year. McLeodganj is the upper part of the town situated 500m above Lower Dharamsala and is the area with the greatest Tibetan influence. It is also where we base ourselves for our visit to the area. On arrival an orientation walk is organised which will include the Church of St John in the Wilderness, the Buddhist Namgyal Monastery known locally as Little Lhasa, and the Kalachakra Temple. We spend this morning in McLeodganj. If the Dalai Lama is giving one of his occasional public audiences we may be lucky enough to be granted permission to attend. This afternoon is left free for further personal exploration in the town. Alternatively you may wish to walk out to one of the temples in the surrounding hills, the closest being the Bhagsunath Temple with its small pool, attractive waterfall and spectacular views. Leaving Dharamsala we continue on to Mandi, once an important town on the salt route to Tibet, now a small temple town held sacred by both Hindus and Buddhists. On arrival we walk to see some of the 81 temples in the town, many of which are huddled on the banks of the Beas River. Today we follow the Beas River north through the lovely Kulu Valley. A slight detour takes us up to the quirky Naggar Castle which overlooks the valley. Our destination is the picturesque town of Manali, surrounded by forests and mountains. Our full day's drive today takes us over the Rohtang Pass (3977m) today to the small settlement of Keylong, the administrative centre of the Lahaul and Spiti district. Along the way we are treated to impressive views of the Himalaya and we can watch the scenery change as we increase in altitude and the reduced oxygen level impacts the flora and fauna that inhabit the area. This morning we take a short drive to the Shashur Monastery. The name means Blue Pines, a reference to the trees that surround the small religious settlement. We'll walk back through the countryside, which will take approximately an hour and will help with our acclimatisation to the higher altitude. After lunch we'll visit another monastery in the area, a red hat sect establishment called Khardang. Set on the slopes facing back towards Keylong and is one of the largest in the area, it was built over 900 years ago but declined in to a state of ruin until it was renovated in the early 20th century. Today we have a very short drive to the town of Jespa where we'll have some free time to relax and enjoy the mountainous landscape. We climb higher today as we head for Sarchu. We climb to the top of the Baralacha La Pass (4891m) and then descend to our campsite for the night. The large pre-erected tents are set up each summer when the Leh to Manali highway is open and are fully equipped with beds and bedding with ensuite toilet facilities. We set off for the long drive to Leh. We wind our way up through the Gata loops, an amazing series of 21 hair-pin bends before crossing the Tanglang La Pass at 5328m - the highest point of our journey. Leh was once a staging post on the Silk Road from China and is a small, picturesque town of about 8,000 people. Sited at 3500m, the summer days are dry and sunny but nights can be cold. The people of this harsh land are Tibetan and have maintained their strong sense of tradition. On arrival in Leh we take it easy and have a short orientation walk through the town. Today we spend the day at the annual Daktok Festival. Translated as 'Rock Roofed Cave' there is a small cave deep inside the monastery said to have been a meditation spot for Guru Rimpoche. The festival is attended by thousands of pilgrims and we join them in listening to traditional long horns and drummers, their music believed to remove ignorance. We will also get to watch the monks perform their scared chham, traditional dances to ward off evil spirits. The predominant faith of the local residents here is the Lamaistic form of Buddhism of Tibet. This is seen clearly in the monastery (gompa) architecture and by the extraordinary number of gods and demons that order the daily life of the community. Today we plan a full day of sightseeing to visit the gompas of Thiksey, Taktak and Hemis. Hemis Gompa, situated some 48km outside Leh, is the largest and most important monastery in Ladakh, a treasure house of golden statues, gem-studded stupas, rare books and fine paintings of the Buddha. This morning we have the opportunity to do some white water rafting (optional) on the Indus River, if water levels permit before driving on to Alchi village. Whilst lifejackets are provided we recommend you are able to swim a minimum of 25 metres unaided. In the afternoon we visit historic Alchi Gompa. Alchi is renowned for its magnificent Kashmiri Buddhist artwork which dates from an earlier period and is quite different from the other frescos in Ladakh. Today we have a number of optional walks planned. The first takes us back across the river to Saspol, then up to the nearby Saspol caves with glorious views across the Indus Valley. This afternoon we can take a slightly longer and very scenic walk back down to the Indus Valley after a visit to Rizong Gompa and nearby nunnery where we may see the nuns sorting and toasting barley (depending on the season). This spectacular walk is the last of the optional walks in this area and takes us up to Likir Gompa which contains some beautiful murals and is seemingly guarded by a 10 metre golden Buddha (please note: some may find this walk strenuous). There is also a small museum of religious artefacts here. This afternoon we drive back to Leh, with the remainder of the afternoon left free. You may opt to walk to the Shankar Gompa, a small but interesting monastery housing an impressive Dukar figure (Avalokiteshvara), complete with 1000 arms all holding weapons, and 11 heads. There may also be time to visit the ruined 17th century Old Palace, which hangs tier by tier on the hillside above the town. Today we take an early morning flight to Delhi and transfer to our hotel. After checking in we begin a city tour of some of the main sights of New and Old Delhi. The Indian capital has long been a phoenix rising again and again out of its own ruins. New Delhi was the creation of the British Raj of the 30's and our tour includes viewing the President's Palace, Lok Sabha (Parliament), India Gate and the Rajpath. We then continue to Old Delhi with its hub at Chandni Chowk Bazaar, a jamboree of deafening barter. A short cycle rickshaw takes us to the Jama Masjid Mosque and we pass by the Red Fort en route. Please note that hand luggage is not permitted on the flight from Leh to Delhi, so you will be required to pack all of your belongings in to your hold luggage. Our tour ends this morning after breakfast in Delhi. Phey To Nimu - White water rafting on Indus River £27.00 (per person, on a sharing basis). Because of the high altitude temperatures in Ladakh can drop dramatically at night, please make allowance for warmer clothing accordingly. It is essential to bring waterproofs, sweater, long trousers (if walking in shorts), warm hat, gloves and sun hat. We strongly recommend walking in good boots. Although all the walks are day walks and optional it is worth noting that trainers and tennis shoes simply do not give the ankle support afforded by a decent pair of boots. Please bring comfortable shoes for relaxing in/evenings. One medium size rucksack or holdall and a day sack for the day. Suitcases are not recommended. Sunglasses, sun cream, water bottle (at least 1 litre) and a torch. Swimwear is useful for the optional rafting. We carry a Portable Altitude Chamber (PAC Bag) on this tour and have a supply of oxygen available if required in an emergency for anyone suffering from altitude sickness. Although entirely voluntary, tipping is a recognised part of life in this region of the world. Some local staff will look to members of the group for personal recognition of particular services provided. Accordingly, you should allow £45 for tipping. Manali, Mandi, Dharamsala and Amristar are all graded standard. Please note that due to high rainfall during the summer months, hotels can sometimes feel a bit damp - due to construction standards this is unavoidable.